Sister Mary Canavan, I.H.M. (formerly Sister Mary of the Infant), died Jan. 18 in Camilla Hall, Immaculata, in the 70th year of her religious life. She was 89 years old. Born in Philadelphia, she entered the Congregation of the Sisters, Servants of the Immaculate Heart of Mary on Sept. 8, 1948 from St. Madeleine Sophie Parish in Philadelphia and pronounced her first vows on April 18, 1949. Sister Mary taught in many elementary and secondary schools in the Archdiocese of Philadelphia, as well as a teacher in Florida and South America. 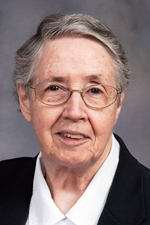 She served in the ministry of Catholic education from 1951 through August 2011 before her final assignment to the Apostolate of Prayer in Camilla Hall in August 2011. Father William Dean celebrated the funeral Mass on Wednesday, Jan. 23 at Camilla Hall. Father Joseph McGeown, a long-time friend of Sister Mary, delivered a beautiful, meaningful homily. Sister Mary has a very large family and in attendance were many family members, friends and beloved I.H.M. sisters. She is survived by her brothers Joseph (Joann), Francis, her sisters Catherine McManus, Roseanne Norris (Walter), Marguerite Teresa Gaffney (Joseph), Eileen Hill, her sister-in-law Doris and many loving nieces, nephews, grandnieces and grandnephews.